The Black Cats have begun their search for a new manager after Paolo Di Canio’s departure. Former West Brom and Chelsea manager Roberto Di Matteo. As Sunderland compiled a shortlist of potential replacements for the sacked Paolo Di Canio it emerged that two names likely to loom large in the club’s thoughts have serious reservations about the post. Sources in Italy suggested Roberto Di Matteo, the early bookmakers’ favourite, is reluctant to take on such a high-risk opening. Still being compensated by his former employers at Stamford Bridge, the ex-Chelsea manager is understood to be reluctant to accept another position unless it offers an outstanding opportunity. It is also believed that Gus Poyet – still locked in a legal dispute with his old club, Brighton, which could complicate any approach from Wearside – may be unsure about taking over at a club where Roberto De Fanti, the director of football, holds considerable autonomy in terms of player recruitment. Sunderland’s struggling squad – including 14 of De Fanti’s summer signings, 13 of them from abroad – are understood to have felt bullied by Di Canio to the point that, on Sunday, they resorted to the extraordinary step of complaining to two board members. By then Ellis Short, the club’s owner, already feared that what even the Italian’s enemies described as Di Canio’s “brilliance” was being undermined by erratic man management. He listened to the message from senior professionals including Lee Cattermole relayed by Margaret Byrne, Sunderland’s chief executive, and De Fanti, and sacked the former West Ham striker that evening. Monday night Short and his board were continuing to work on compiling a shortlist of potential replacements that is still to be finalised but which could include, among others, Steve McClaren. Out of work and readily available candidates will be targeted before those in long-term employment. With Kevin Ball, normally in charge of youth development, regarded as a safe pair of caretaker hands there is no rush to hire the new man. Ball could well remain in charge for Sunday’s home game against Liverpool as well as Tuesday night’s League Cup tie with Peterborough at the Stadium of Light. The dressing-room atmosphere is certain to be more positive than during the latter days of Di Canio’s near six-month reign during which Sunderland took one point from five Premier League games and players complained about damaging public criticism and scathing, thoroughly demoralising, private deconstructions from their head coach. It is understood that players recognised Di Canio as a quality coach and had bought into his training methods, tactics and even the dietary regime under which ketchup and cola were banned while caffeine was rationed. Even so, his ban on players interacting with club staff, particularly on match days, was regarded as a step too far and when results went awry his time was limited. With Di Matteo, especially, and Poyet apparently lukewarm about replacing the Italian, the way could be open for McClaren, the former Middlesbrough, England and FC Twente coach, to return to Premier League management. An excellent coach, keen on the passing football Short craves and prepared to work with a director of football, McClaren may be far from the dark horse he initially appeared. Whoever takes over is unlikely to emulate Di Canio’s confrontational approach. “You cannot manage in the Premier League these days through a fear factor. You have got to be able to manage individuals,” said Steve Bruce, the former Sunderland manager now in charge of Hull. Email “Favourites Di Matteo and Poyet set to turn down Sunderland hotseat”. 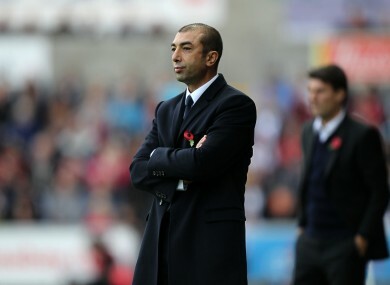 Feedback on “Favourites Di Matteo and Poyet set to turn down Sunderland hotseat”.